You Know Shannon Can Ski, But Wait Until You Hear Her Speak! 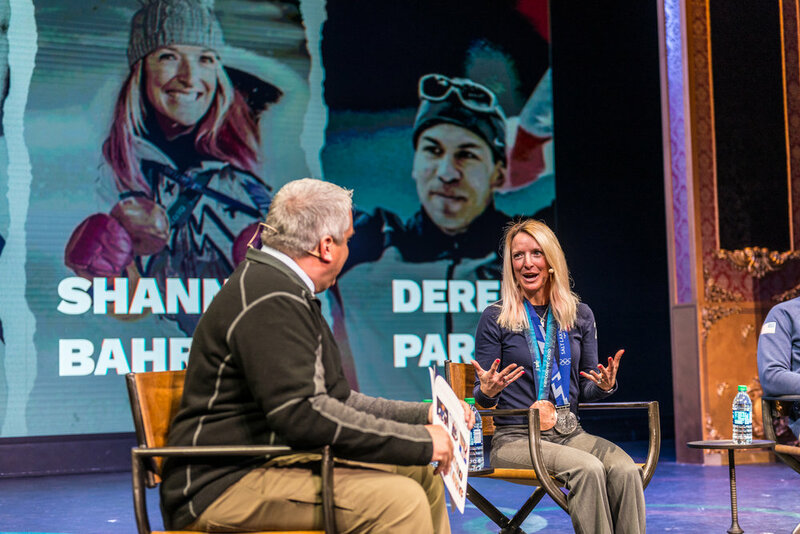 Shannon Bahrke is one of the most recognized Olympic skiers with her signature pink hair and big smile, but it is her ability to make a lasting connection with her audience that makes her an exceptional keynote speaker. Shannon's exciting and inspirational keynote speeches address winning, goal setting and the commitment required to achieve success. A fantastic cornerstone for any corporate event, let Shannon inspire guests with her welcoming style and memorable take-aways. Shannon invites you into her world and takes you on her journey through three Olympics - Salt lake City, Torino and Vancouver. In this exciting keynote, punctuated by breathtaking visuals, audiences are motivated by the tenacity and triumphs of this world-class athlete and inspired by her setbacks and comebacks. Shannon's energy and authenticity make her a compelling and accessible speaker. If you can imagine what it would be like to ski the bumps - while competing on speed, accuracy and audacious aerials! - you can imagine the thrill of experiencing Shannon's Olympic story. What does it take to win - and keep on winning? How do you keep the fire burning and the passion alive? Competing and winning on a world stage for more than a decade shaped Shannon's core philosophies as an athlete, entrepreneur and woman. In this keynote, she shares her Olympic experiences and lessons learned. With her signature style and contagious energy, Shannon offers a fresh look at winning and winning strategies. This keynote will provide you and your team with discussion topics and actionable takeaways toward achieving dynamic, ongoing success. If you think goal-setting is straightforward and self-explanatory, then you need to hear this talk. In her most instructive keynote, Shannon walks you through the steps of identifying your true ultimate goal - then testing it, breaking it down, and achieving it. To endure and succeed in the exhilarating yet punishing sport of Freestyle Skiing is tough business, and in the final years of her career, Shannon learned about more productive goal-setting techniques. Let her share her champion insights with you and change how you set goals from this point forward. Shannon’s session was right on point with our theme. She was inspirational, engaging and unbelievably energizing. Her entire presentation was all about “daring” to achieve and dream big. I first met Shannon back in the summer of 2017 by chance. Within 30 seconds of meeting her, I just knew she had to come and talk to our group. I knew they would feel her inspirational energy the way I did on that hot summer day. We received so much positive feedback from our attendees. Most saying, Shannon’s story and energy were truly inspiring them to dare to take a chance. They continued talking about the session for the rest of our time together and they are still talking back in their home office locations around the world. — Sara Miller. Manager of Corp. Meetings & Events, Usher-Smith Laboratories, Inc.